The Veil is a piece of sea silk fabric measuring about 17 by 24 centimetres, placed between two panes and mounted into a decorated frame. Allegedly, the fabric used to be a little bigger, but now it is the size of a human face. 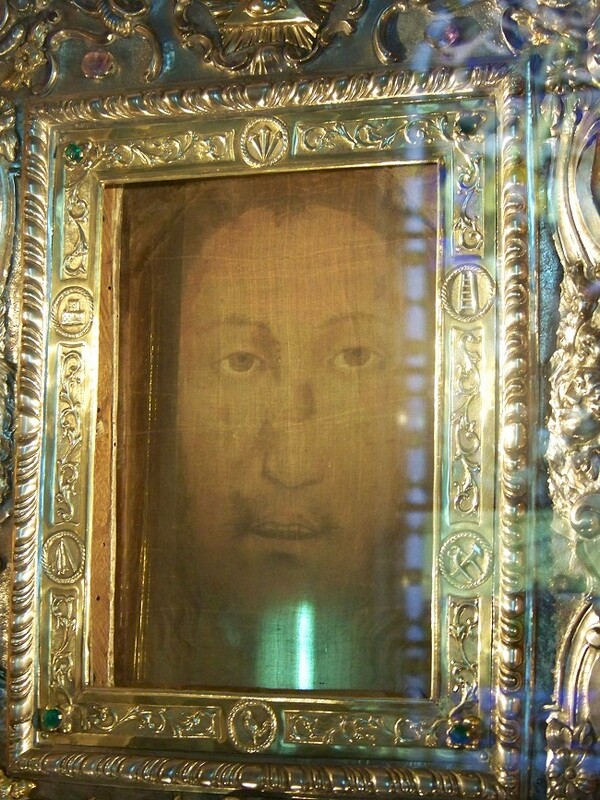 Throughout centuries the rims were cut off and used as relics (similarly to the fabric of the Turin Shroud). The Veil has not always been exhibited in this way. It was also folded lengthwise (one time) and crosswise (three times), which is easily noticeable because of the lighter lines. The image is practically invisible when observed against the light and the colours are revealed when one looks at the image from an angle. The colours change and when an observer moves just a few millimetres, he/she will see different colouring. The Veil may be observed both from the side of the altar and from the other side, having taken the stairs. The reliquary itself is placed in an additional glass coffer. However, the veil is not more than 40 centimetres away from the pane, which makes it possible to have almost direct contact with the Face. The conditions are not favourable for taking photos. Poor lighting forces the use of long exposure time and reduces the depth of field. The coffer's pane is covered with handprints of praying people. 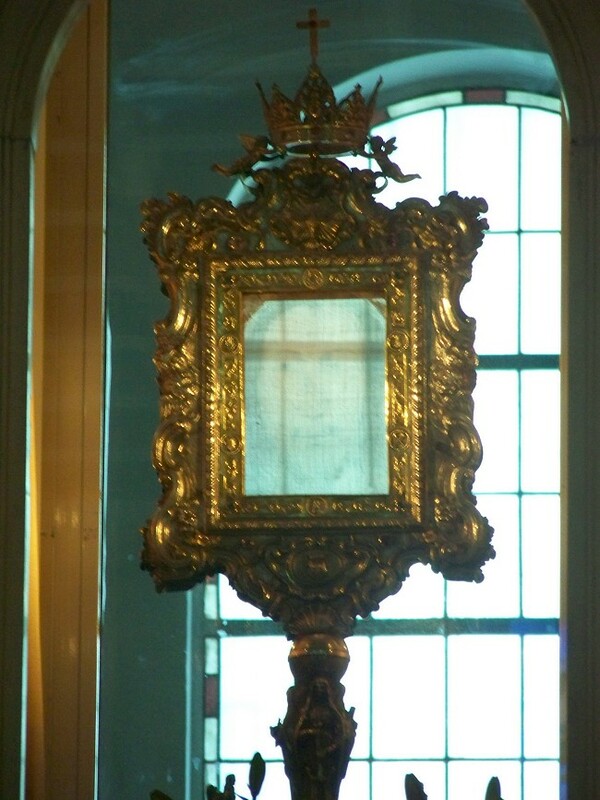 However, no photo may stand for the direct contact with the extraordinary relic. 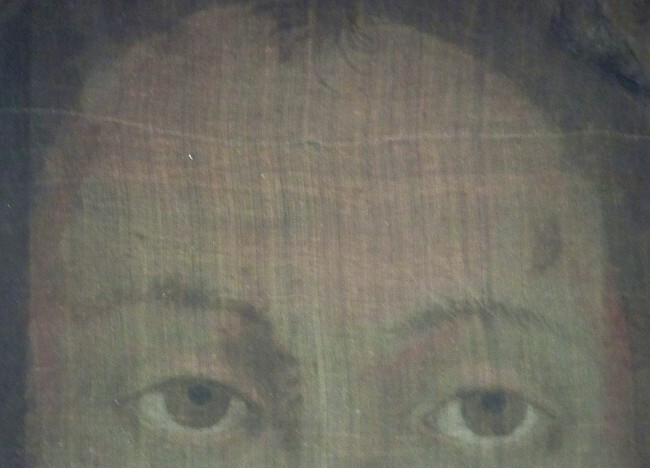 The fabric was cropped many times, which left only an outline of the head. In the top right corner and top left corner one may notice silk insets which were sewn in to keep the rectangular shape of the image. However, they have a completely different texture than the original and thus let less light through. The distinctive strand of hair is visible in the top part of the forehead. 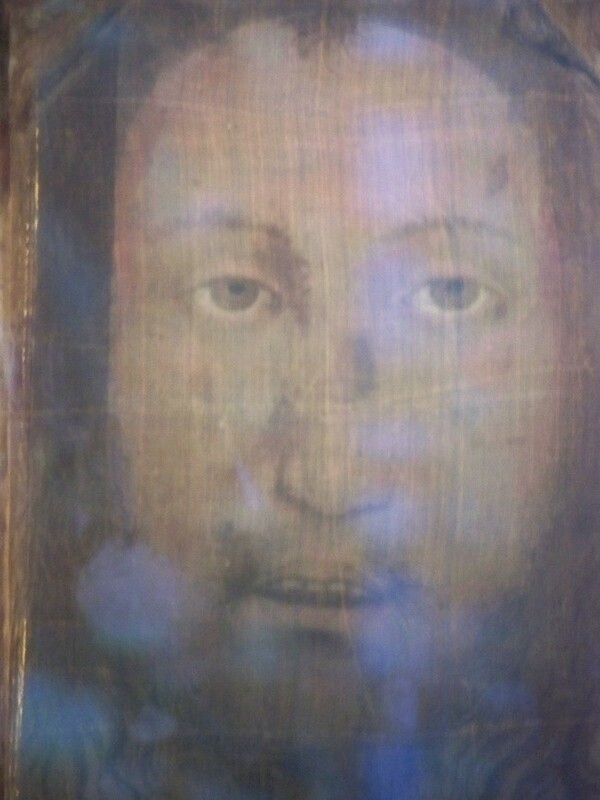 This detail is found on numerous medieval depictions of Christ. 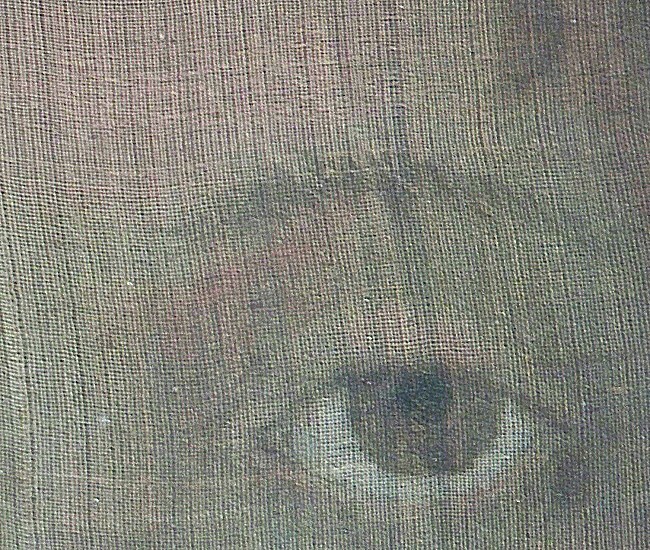 Research has shown that the fibre in areas of the sea silk fabric depicting the pupils are significantly carbonised. 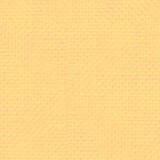 Other areas of the fabric do not indicate any presence of dyes or paints. The fabric is incredibly delicate and hand-woven. 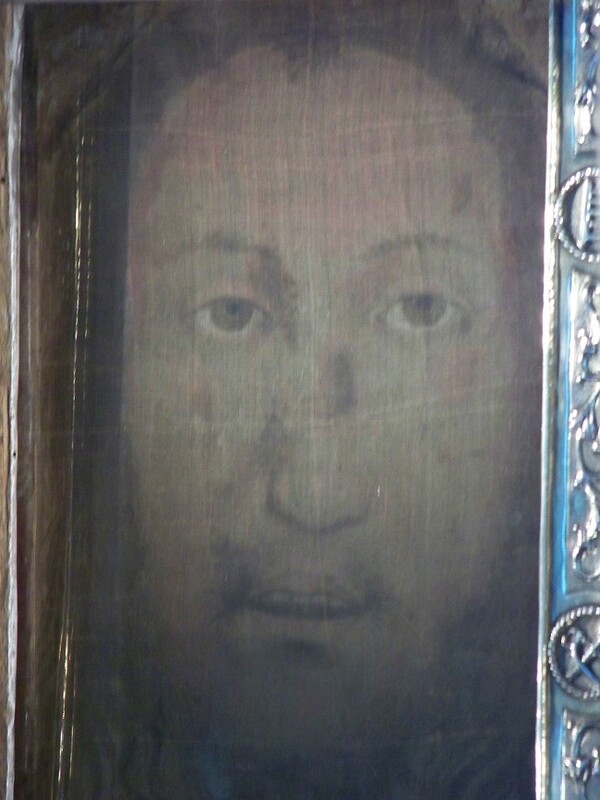 Up to this day it has not been explained how the image was imprinted on the veil.